The Aging and Disability Resource Center of the North staff can provide support for individuals with dementia, family caregivers and the community at large. On this page, you’ll find dementia-related information and programs offered by the ADRC of the North. You will also have the opportunity to learn more about dementia through videos and helpful links. If you have questions, please contact us at 1-866-663-3607 and our friendly staff will be happy to assist you. Memory changes or other changes in how our brain works can be scary. 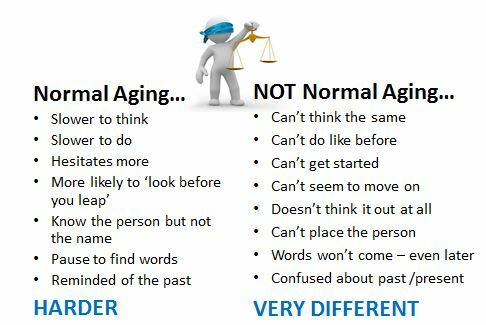 Understanding the difference between “Normal Aging” and “Not Normal Aging” is the first step in sorting out these changes. There are many reasons why these changes take place. In this section, you will be able to learn more through printable documents, video clips and links to other websites. If you find yourself or someone else with similarities listed in the left column (“Not Normal Aging”), contact the ADRC of the North for information on memory screens or resources for a thorough medical assessment. View the video below for more information. Early detection matters. Knowing the early signs of dementia will help identify if there is a need for a more comprehensive evaluation. The Alzheimer’s Association offers a free, online training to learn about the 10 Warning Signs of dementia. Click Here to go directly to this training opportunity on the Alzheimer’s Association website. Try to find a way to increase the smaller slices to bring your brain health back to balance. The Aging and Disability Resource Center of the North staff has been trained and certified to provide memory screens. The screening tool that we use takes about 15 minutes of your time. Staff will review the screen with you and provide information and resources for supporting your brain health. Why have a screen done? Think of the memory screen as a wellness tool, like a blood pressure, cholesterol, or stroke screen. You can have a memory screen done if you have concerns, a family history, or before you notice memory loss symptoms to establish a baseline that you can refer to in the future. Knowing your cognitive baseline allows you to become proactive in monitoring your brain health. Memory loss caught early can mean more control of your life and a higher quality of life. What if the screen shows areas of concern? The screening tool used by the ADRC-North does not diagnose dementia. It provides an assessment of how your brain is functioning in a single moment. There are many reasons why a screen might detect cognitive or memory concerns, such as stress, sleep imbalances, challenges in vision or hearing, chronic pain, medication side effects…. The list goes on. If concerns are noted, the staff who administered the screen will share some possible causes related to the screen results and refer you to a qualified health care provider. Memory screens are confidential but can be shared with your health care provider if you choose to do so. A medical provider is the only person who is able to provide a dementia diagnosis, and this is commonly done only after other possible causes of cognition or memory changes have been ruled out. If, upon further evaluations by a medical professional, it is determined that you have dementia or mild cognitive impairment, you can be proactive in developing a support system and become involved in early intervention programs that may slow the challenges experienced with dementia. The ADRC-North participates in the National Memory Screen Day each year. It is generally held on the third Tuesday in November. Last year there were 144 people who attended the sites for screens or information. Here is a video clip that talks about a prior year’s event. Where can I get a Memory Screen? Screens can be done in our offices or in your home. Call our friendly staff at 1-866-663-3607 to set up a time to have your screen completed. We recommend an initial baseline screen and then a re-screen every year to monitor your brain health. The memory screens that we provide are free of cost. I have more questions about the screen… How can I learn more? Contact the ADRC of the North at 1-866-663-3607 and our staff will be happy to answer any questions you may have. The goal of the Memory Care Connections research program (a replication of the NYU Caregiver Intervention) is to provide knowledge and support to the people caring for their loved-ones with dementia. When family members who are also caregivers receive support and services they need, the person with dementia also benefits. Programs like Memory Care Connections has shown to be effective in delaying the need for nursing home care. Memory Care Connections is a program for a live-in caregiver caring for a loved one with dementia and their family members. It is facilitated by our Dementia Care Specialist in your home or location of choice to best meet the needs of the caregiver through support, guidance and education. Call 1-866-663-3607 for more information about Memory Care Connections. Memory Care Connections is a 6-session counseling program that evolved from the experience of clinicians at New York University School of Medicine. The study found that caregivers who participated in the program experienced many benefits—including fewer symptoms of depression and stress, as well as better physical health—compared with those who did not participate. They also reported increased satisfaction with the emotional and practical support they received, as well as increased closeness to their families. 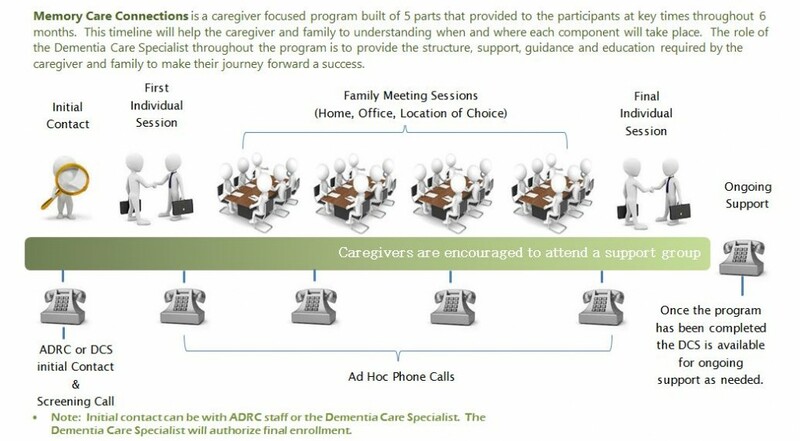 As a result of the program, many caregivers were able to postpone or avoid placing their spouses in residential care. – Assess your situation and discuss your concerns. – Help you and your family understand Alzheimer’s disease and related dementias and how the disease may progress over time. – Work with you and your family on developing a plan that supports you. – Discuss strategies, provide coping tools and problem solving skills that will help reduce stress. – Assist you in obtaining community resources and supportive services. – Be just a phone call away. The Memory Care Connections program is available in Ashland, Bayfield, Iron, Price & Sawyer Counties. Language Enriched Exercise Plus Socialization (LEEPS) is a program developed to aid in improving or maintaining a person’s physical and brain health. Trained volunteer(s) will assist individuals in their home and community with a customized exercise program developed by a physical therapist along with you primary care provider. Studies show that improving your physical strength and brain health may reduce a person’s risk of falls and improve one’s overall mood. The LEEPS program has two main components: the exercise/cognitive stimulation session and the outing in the community. Each part takes place on a different day. Volunteers are responsible for assisting program participants to complete each of the two main components every week. One way to stay independent longer is to keep the body active. Animal testing shows a connection between exercise and the brain. Dr. Michael Raab works with the aging brain. 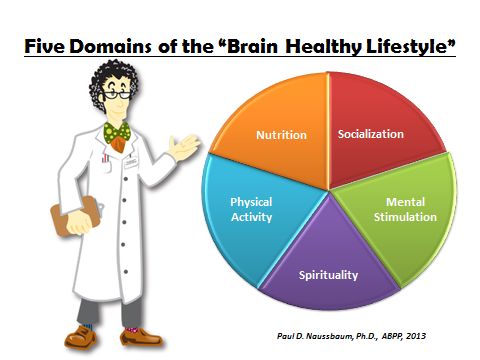 Preliminary research is showing much the same in humans; that staying physically fit may slow brain shrinkage. A Memory Cafe is a wonderfully welcoming place for individuals with Alzheimer’s or other types of the dementia/brain disorders, as well as people with all forms of mild cognitive impairment. Each Memory Cafe focuses on different aspects for a unique experience. You may find some are focused on education and others may be activities-based, such as demographic-appropriate music and dancing, crafts, or painting. This section will cover the “why” and “how” behind community awareness and support for our friends, families & neighbors. As you will see below, our community is aging. As the greatest risk factor for developing some type of dementia is “getting older”, we need to start making changes now to support us tomorrow. View this video clip to experience the difference a Dementia Friendly Community can make for a person with early cognitive changes when when attempting to complete daily tasks in their local community. Our state is aging at a fast rate. Compare the pictures below that show the change in our population over the next 20 years. The dark blue indicates a high percentage of people over the age of 65. Click here to go the the Wisconsin DHS website for more information. We need to be prepared for the challenges that are associated with increased age. Provide a “Lunch~N~Learn” for your staff. Have a member of your staff participate in the “Train the Trainer” program and train your current and future staff in house. Once your business/agency has completed the training and at least 75% of your staff is trained, you will receive a certificate and a packet of information and resources that your staff will be able to refer to. Our goal is to provide you and your staff the awareness to identify a customer or consumer who may be having some cognitive challenges, and know how to best assist them while they are at your business or agency. 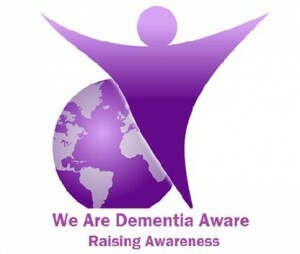 Please contact your local Dementia Network coalition for more information. If you are not sure who to contact, our friendly ADRC staff will assist you in finding the right contact. Wisconsin Silver Alert Program: View the video clips below to hear more about the program. If you would like to sign up to receive Silver Alerts, visit the “Crime Alert” website. click here to watch a video regarding the start-up of he “Silver Alert”. click here to watch a video regarding a recent success as a result of the “Silver Alert”. A public safety program designed to protect and locate missing persons due to wandering. Contact your local law enforcement agency to find out if Project Lifesaver is available in your area. Find the area you’re interested in, then click below to see the Memory Cafe Flyer.